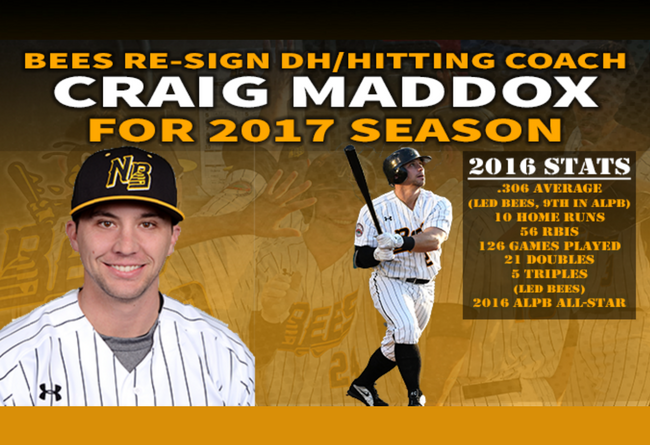 (New Britain, Conn., Feb. 8, 2017) – New Britain Bees team officials today announced that the team has re-signed Designated Hitter and Hitting Coach Craig Maddox for the 2017 season. Maddox is the first player to sign in New Britain in 2017. Acquired from the Southern Maryland Blue Crabs prior to the 2016 Inaugural season, Maddox hit .306 last year, a career high, to lead the Bees and finish ninth in average in the Atlantic League of Professional Baseball. Maddox appeared in 126 games for New Britain in 2016, second only to Jovan Rosa’s 140, and hit 10 home runs, 21 doubles and five triples while driving in 56 runs. Maddox was also one of six Bees to represent the Liberty Division at the 2016 Atlantic League All-Star game in Lancaster. Primarily serving as the Bees’ Designated Hitter, Maddox also appeared at first base, third base, and in right field during the season. A native of Locust Grove, Georgia, Maddox is entering his third full season in the Atlantic League, and ninth season in independent baseball. Signed by the Detroit Tigers after playing in college for Southeastern University, Maddox also spent time in the Atlanta Braves organization. Between affiliated and independent baseball, Maddox has played in 704 professional games, and set career highs in games played (126), runs (56), hits (156), triples (5), average, and runs batted in (56) last season. In addition to his primary role as the Bees’ Designated Hitter, Maddox will once again serve as the team’s hitting coach during the 2017 season.